Licensing programs are offered to the maritime professional who has the time on the water, but not the credential. Taught by experienced instructors, these courses prepare the student with the skills, training and testing to pursue licenses from the OUPV - Operator of an Uninspected Passenger Vessel of Less Than 100 GRT to Master Less Than 200 GRT. This training may also include Commercial Assistance Towing Endorsement. 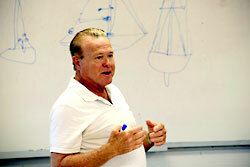 The learning objective of these programs is to prepare each student to become a responsible USCG Licensed Captain. Upon successful completion, students will receive a certificate recognized by the USCG. Simply submit, within one year, the original certificate along with your application package and applicable fees to the USCG Regional Exam Center. Upon their approval of your package, they will send you your ORIGINAL License. (OUPV) Operator of Uninspected Passenger Vessel of Less than 100 GRT (64 hours) - Captains of vessels carrying up to six passengers on a non-inspected vessel under 100 gross tons. Candidates must be at least 18 years old and in good physical and mental health. With 360 days of documented underway time, you may have satisfied the Sea Service time set forth by the United States Coast Guard. Non-US citizens may obtain this license but will be limited to undocumented vessels. Depending on sea experience, this license is available in one of two formats. OUPV Inland / Great Lakes - The OUPV Inland license may be obtained with 360 days of documented service time on any waters. To obtain a Great Lakes endorsement, 90 days of your total 360 days must be on the Great Lakes. Also, you must have 90 days of recency time as part of the 360 days total. OUPV Near Coastal - The OUPV Near Coastal may also be obtained with 360 days of documented service time. A minimum of 90 days of this experience must be obtained on Near Coastal waters. Recency time of 90 days must be within three years prior to application. Upgrade from OUPV to Master Less Than 100 GRT (24 hours) - This is a comprehensive course with practice exercises and written final examinations. A USCG upgrade to a 100 Ton certificate will be issued upon completion. Upgrade from Master Less Than 100 GRT to Master Less Than 200 GRT (28 hours) - This course satisfies the examination requirements for Master to 200 gross tons. Mate License 25 to Less Than 100 GRT (88 hours) - Candidates must be at least 18 years old and a U.S. citizen. This license requires a minimum of 360 days of documented sea time on any waters. To obtain a Great Lakes endorsement, 90 days of Great Lakes time is required. For recency, at least 90 days of your service must be within 3 years prior to application. Master License 25 to Less Than 100 GRT (88 hours) - Candidates must be at least 19 years old and a U.S. citizen. Master / Inland of Less Than 100 GRT - The Master Inland license may be obtained with 360 days of documented service on any waters. To obtain a Great Lakes Endorsement, 90 days of Great Lakes time is required. At least 90 days of your service must be within three years prior to application. Master / Near Coastal of Less Than 100 GRT - The Master Near Coastal license is valid for all U.S. waters including the Great Lakes and 200 miles offshore. This license may be obtained with 720 days of documented Sea Service. A minimum of 360 days of this experience must be obtained in Near Coastal waters. Recency time of 90 days must be within three years prior to application. License Renewal Less Than 100 GRT (8 hours) - The applicant who completes this 8-hour license renewal course with a passing grade of at least 90 will receive a certificate to be presented to the USCG within one year and will satisfy the training requirements for a deck license on vessels of not more than 100 gross tons. Commercial Assistance Towing (4 hours) - Assistance Towing Endorsement offered with OUPV Master/Mate 100 Ton - no fee. If taken with 100 Ton Upgrade or as a stand alone program, the fee is $100. The successful student must be able to use basic math skills and the English language in order to fully benefit from the program. Students must have an official photo ID on the first day of class. Students who do not pass the licensing exams may return to another scheduled class within 90 days for review and examination. After that time, students may retest for the additional fee of $100. These options are offered on a space available basis. The student who is still unsuccessful after the additional test must commence a new program. NO HIDDEN COSTS: Tuition includes Study Materials and Testing. The Registration Form must be completed and signed (by a parent or guardian if the applicant is younger than 18) and returned to the Chapman School along with the *non-refundable deposit. Tuition includes books, materials, and USCG License Testing Fees. Campus housing consists of dormitory apartments. Each unit contains a bedroom, convertible living room/bedroom, bath, kitchenette and a covered porch. The number of students per unit during this program is a maximum of two. All units are air-conditioned, fully furnished and equipped with refrigerator, countertop range and cooking utensils. Housing is offered on a space available basis. The School is not responsible for the loss of any personal property. Sorry, no pets. For a second or third person in the party add $20 per night/per person. Housing fee is due 10 days prior to the start of class. Since our certificate is good for one year, you do not have to have all of your sea time prior to taking our course. You have one year to complete the sea service requirement after successful completion of our course. The US Coast Guard Officer in Charge (OIC) makes final decisions on sea time approvals. It is the responsibility of the applicant to determine his or her eligibility for USCG licensing. Applying for a USCG License or renewing an existing USCG License? Chapman School can guide you through the process and assist you in getting your USCG package ready to submit. Anyone applying for either an original or renewal of a U.S.C.G. license must submit evidence of drug testing with their paperwork. Chapman School is a U.S.C.G. approved drug testing facility. U.S.C.G. / D.O.T., Federal Drug testing form is available for onsite students and walk-in clients. The cost is $85.00. For more information, please contact the Registrar at 772-283-8130.